My journey through yarn and life. ...dreams really do come true. 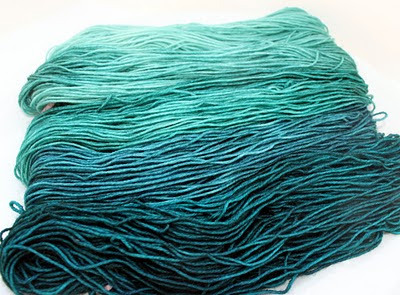 There is a group on Ravelry called What a Kool Way to Dye. This group is for yarn dyeing enthusiasts who prefer to dye with Kool Aid and food coloring. I love this group. It provides great inspiration as well as techniques. Every month, they have a DAL- Dye A-Long. You can choose to participate or not, but there is a theme that you use to dye your yarn with. This February the theme is gradients. I tried to dye some socks I knit last year in a gradient style and failed miserably. I know now that I had the wrong technique, not enough dye and I didn't allow for enough time. This time, HUGE success. I freakin' love this yarn. Here's a Knitty tutorial showing how to do it. I followed it, mostly, but will explain what I did precisely so you can try it too! In Knitty's tutorial, they wound the yarn into a really long skein. I did not. I weighed my yarn and then divided it into 5 mini skeins of equal weight. I did not cut or separate the mini skeins- they were all attached to each other by one strand of yarn. I then soaked this in lukewarm water while I prepared the dye bath. In my crock pot, I poured in 8 cups hot water and 3/4 cup white vinegar. I added 1 teaspoon McCormick's blue food coloring and 1/4 teaspoon green food coloring. Stirred it in, put the lid on and turned it onto high. I waited until it was nice and hot and there was steam on the lid. I took my yarn out of the water and gently squeezed the water out of it. I lowered all but one mini skein into the pot (make sure that the one you leave out is one of the ends.) I then quickly plunged the end mini skein into the hot dye bath and pulled it right out (please DO NOT forget your rubber gloves!!) I layed the mini skein into a bowl next to the crock pot, put the lid on the rest of the dye bath and set the timer for 10 minutes. After the 10 minutes, I gently squeezed the water out of the first mini skein that was in the bowl. I now placed it onto a plate next to the bowl. I reached into the dye bath and took out the next mini skein- #2. I laid it in the bowl. I took a 2 cup measuring cup and scooped out at least a cup of water/vinegar solution from the dye bath (the liquid was nearly clear- the dye was all used up.) I microwaved the liquid until it was boiling and added 1/2 teaspoon of blue food coloring and 1/8 teaspoon green food coloring. I poured it into the crock pot dye bath and gently stirred it. I replaced the lid and set the timer for 20 minutes. After the 20 minutes, I again gently squeezed out the water from mini skein #2 and put it on the plate with #1. Pulled out mini skein #3 and placed in the bowl. Got more water from the dye bath, heated it until boiling and added 1/2 teaspoon blue coloring and 1/8 teaspoon green coloring. Stirred it into the dye bath, replaced lid, set timer for 30 minutes. After 30 minutes, do the same thing with mini skeins #3 and #4. With the last skein in the crock pot, I set the timer for 40 minutes but checked on it at 30 minutes and saw that the dye bath water/vinegar solution was already mostly clear. I went ahead and pulled it out at that time. After the skeins were all cooled, I gently washed them in lukewarm water with some wool wash. Then just hang to dry and skein or wind it up and enjoy! In the end it took about an hour and a half of dyeing time and 2.5 teaspoons of blue food coloring and 5/8 teaspoons of green food coloring. 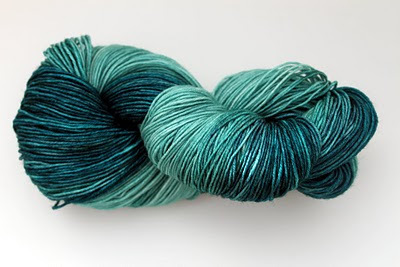 Later this month I plan on doing another gradient dye with a friend. I haven't decided what color to do but I'm extremely excited. Let me know if you have any questions on what I did. Wow, that is gorgeous! I can't see what you do with it! I am over here from WaKWTD too. Thank you so much for the mini skein inspiration. I wasn't going to do a gradient because the knitty tute looked like too much work. My yarn is drying now. I will get my photos up soon. Gorgeous colors! Thanks for sharing! 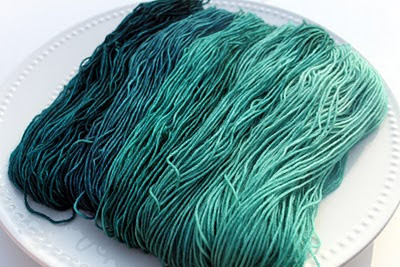 I recently tried dyeing yarn and I am hooked, too..... thank You for sharing details, I might try this next time! Mmmmmmmm, it looks so beautiful. 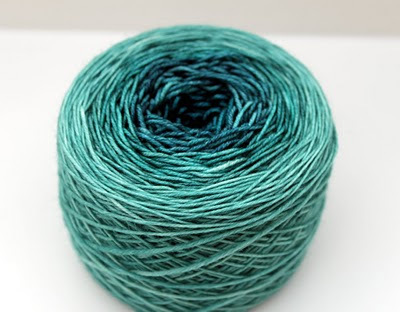 Just yesterday I was looking at some yarn for dyeing and wondering if I was brave enough... after reading your post I think I may do it! You should try it! We all started out as a newbie! AH. MA. ZING. Just stunning. Great job! I was trying to get this effect on my last dye job. But the colors were so disparate that they don't fade into one another. (Probably because I used several different types - Kool-Aid, Wilton's, and something from Duncan Hines - to try and get the colors close enough. Then I dyed them all simultaneously in separate jars in a pot on the stove.) It will probably make a very nice self-striping sock yarn, but I wanted gentle color shifts for the shawlette I have in mind. Now that I have some food coloring and your very helpful post, I can do it right. Thanks for sharing! Thanks for posting this-Gave me the courage to give it a try-I am now knitting the Sea Leaves Shawl with the results of my attempt! How many miles will Maiya knit in 2013? Picaresque Gent- for yer moustache! Tattoo obsessed redheaded knitter. Or is it knitting obsessed tattooed redhead? My journey through yarn, food, and life.